Yellow Pages no more. Flickr/Thomas Hawk. CC BY-NC 2.0.http://test.test The announcement that the Yellow Pages will be ceasing its 50 year print run in January 2019 reminded me of the grimacing strongman Geoff Capes. In the 1980s the ability to rip a phone directory in half seemed to be an ultimate symbol of human strength. In fact, the Guinness Book of Records still carries a number of records for phonebook tearing – the greatest number of phonebooks ripped from the spine in one minute is 33. Yet when the last copy of the Yellow Pages is delivered, its ongoing legacy will not be limited to such trivia. Launched in 1966, the Yellow Pages is perhaps the best known classified business directory. Known for its bulky presence, hence the wonder at ripping, it became a staple prescence in homes and workplaces. 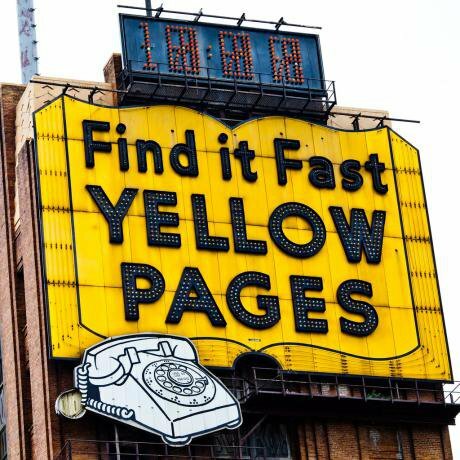 When a business or service was needed, the Yellow Pages was a trusted source. The most recent version stretches from abattoirs to yoga, covering everything from taxidermists to graffiti removal. Inevitably the rise of the internet has led to a dwindling interest in these artefacts of a slower age. The comparative slimness of the recent editions is testament to this: the book is getting smaller with each passing year. Ripping the Yellow Pages is no longer quite such a feat. The famous Yellow Pages TV adverts give a sense of the importance and cultural reach of these hefty yellow books. Stretching across the 80s and 90s, the best known of these adverts involved a man attempting to track down a book. Working his way through the list of booksellers, JR Hartley finally tracked down a rare copy of his own book Fly Fishing. This was part of a series of adverts in which people turned to the Yellow Pages for help – in another case a house party leaves a young man in need of a French polisher to remove a scratch from a table before his parents arrive home from holiday. Yell, who are behind Yellow Pages, even have a ‘classic adverts’ section of these adverts on their YouTube channel. In all cases, these books were depicted as a comforting presence that could impose order, find the things we need, resolve problems and allow us to negotiate a complex world. The adverts stick in the mind partly because of how smart they were, but the apparent power the Yellow Pages to render a messy world knowable and accessible also played a part. As these adverts suggest, the influence of the Yellow Pages is actually to be found in the power of its classifications. A little of that power can be found reflected in company names. Today we have companies preoccupied with search engine optimisation, aimed at getting the highest possible position in Google searches. Something similar happened with the Yellow Pages, but instead of the logic of Google’s PageRank algorithm governing namings, it was the alphabetised classifications that held sway. As well as choosing what category to be included within and what type of listing to have, companies would sometimes also name themselves with this format in mind. If you looked for a Taxi for instance, you would be confronted with a series of attempts to game the format – with A1, AAA, and so on, used so as to appear as early as possible within the listing. This is a small indicator of how the classificatory systems we use actually come to shape the world as well as what we know of it. When we encounter objects, places, people, animals and the like, our ‘encoded eye’ places them within those grids. Classifications don’t just shape behaviours, they also influence what we know of the world and what we can discover. In their book Sorting Things Out, Geoffrey Bowker and Susan Leigh Star explored the many ways that classifications play a part in how our lives are ordered – from the classification of people, types of work and medicines to the way we organise our homes. They found that we develop our own classificatory systems that contrast and match with the broader classifications that we are given. Think, for instance, of the way that music is organised. We may have our own ways of organising our music collections and playlists, and these might compete with broader genre classifications. In the classic book The Order of Things, Michel Foucault provided a historical account of the importance of classifications for shaping how knowledge develops. In that book, he looks at how classificatory systems are established and embedded in the development of knowledge. How we order the world matters. Categories shape what is known and how it is understood. Foucault suggested that these classifications form a grid. When we encounter objects, places, people, animals and the like, our ‘encoded eye’ places them within those grids. The result is that those grids have a big influence on how we see the world around us. Categories and grids can be powerful in helping is to manage a baffling world, they can be liberating. They also bring limits and can push us towards reductive, restrictive and even damaging interpretations and attitudes. Theodor Porter, in his work on the trust we place in numbers and quantification, has argued that categories can have the effect of ‘abstracting away their individuality’. Such categories have the effect, Ian Hacking has suggested, of ‘making people up’. It is for this type of reasons that Imogen Tyler has argued that we should be more aware of the ‘consequences of classificatory systems and the forms of value, judgments and norms they establish’. In this vein, to pick just one pertinent example, Nisha Kappor and Kasia Narkowicz’s ground breaking work illustrates, just how damaging the blunt application of categories like citizenship can be. The point is that categories are not neutral things nor are they natural or fixed, their selection and application is an active presence that frames how we see the world. Of course, the Yellow Pages is in no way a damaging presence, but it might give us pause to reflect more broadly on the part that categories play in our lives, especially as they are being reshaped by social media and the like. As an extension of things like classified newspaper advertising, the Yellow Pages was a significant part of the development and cementing of the classificatory grid that orders the world for us. As classifications continue to shape knowledge, they will carry traces of things like phone directories, even as we move on to new media forms. They will live on in the way that content is classified in things like Twitter lists, Pinterest boards, Spotify playlists, tagged images on Instagram, Snapchat and Facebook and even in the hashtags we use. These classifications are mutating in new directions as the media themselves change. Classifications in social media are notably more dynamic and varied in their form. An obvious observation to make about the end of the Yellow Pages in print is that it provides yet another marker of our move to an online and immaterial world. However, there is a little more to understanding what this endpoint might reveal. The Yellow Pages was part of the story of how we have come classify the social world. Its print run might come to an end, but our impulse to categorise and classify complexity and mess will continue. It is in the way that it provided and cemented classificatory ways of approaching the world that the legacy of the Yellow Pages will continue.